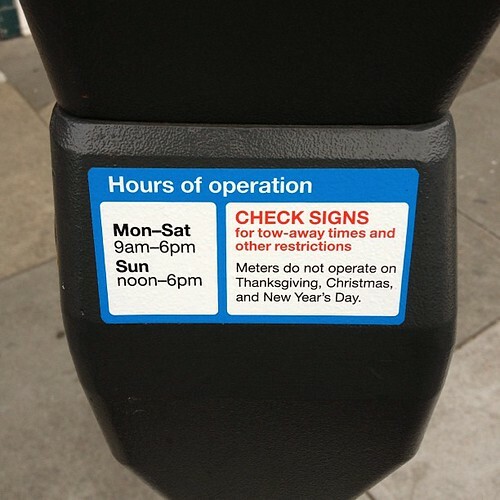 Akit's Complaint Department: Strange Observation About the SF Parking Meters - 25 Cents an Hour? Strange Observation About the SF Parking Meters - 25 Cents an Hour? Parking in San Francisco can be a challenge, and those pesky parking meters can empty your pockets of quarters in no time. Even the city owned garages have odd prices. Now they charge more for times when parking is in high demand, but gives a nice lower price during less demand. Since my appointment was at 9AM, I arrived too early in the neighborhood, so I parked in a parking space just across the street from the dental office. The meter said starting at 9AM, the parking fee would be $2 per hour. Since I had some time to burn, I got back in my car since it was cold and played around with the SFpark iPhone application. It was correct that the parking would be $2 an hour, so I toyed around with the application to see how much it would cost to park somewhere further. Around the corner from where I parked, the 9AM price was $1.50 an hour. Not bad for a small 50 cent savings, but how about on Geary Boulevard? I found out the parking on Geary Boulevard is just 25 CENTS PER HOUR from 9AM to noon. What a heck of a bargain and it was just an extra couple of minutes walk from where I was currently parked. Really? Just 25 cents? 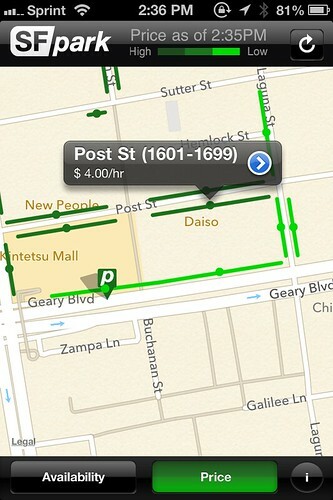 That's a huge difference than on Post Street where it would have cost me $2 a hour. Also, one of the perks of parking at one of those smart looking meters is I can pre-pay the meter. Since my appointment was at 9AM, I put 50 cents in the meter for two hours at 8:45AM, and the meter won't deduct the money until 9AM, therefore the meter would expire at 11AM. I highly suggest purchasing a SFMTA Parking Card. It's accepted at all city parking meters, and it's better than a credit card because not all city meters accepts Visa or MasterCard. I would also recommend the "PayByPhone" app. It makes paying for meters a piece of cake: you link your account to a credit card and then just enter the number on the meter and how much time do you need. It will even message you when your time is about to expire and let's you top off the meter remotely. @eugene. I frown on Pay By Phone because it also includes a 45 cent surcharge. Note: You can also pre-pay at the old meters. Yes, make the single mom with 3 kids walk a couple of extra blocks because she is well, um poor? We all paid to build these streets. Changing the rules midstream to pay the bloated salaries of our city workers is a sham. Down with the citys "elitist" parking meters.